Sal-like protein 4 (SALL4) is a probable transcription factor that belongs to the sal C2H2-type zinc-finger protein family. SALL4 contains 7 C2H2-type zinc fingers and may interact with NANOG. Defects in SALL4 are the cause of Duane-radial ray syndrome (DRRS) and oculootoradial syndrome (OORS). Rabbit polyclonal antibodies were produced by immunizing animals with a GST-fusion protein containing the N-terminal region of human SALL4. Antibodies were purified by affinity purification using immunogen. Fig 1. 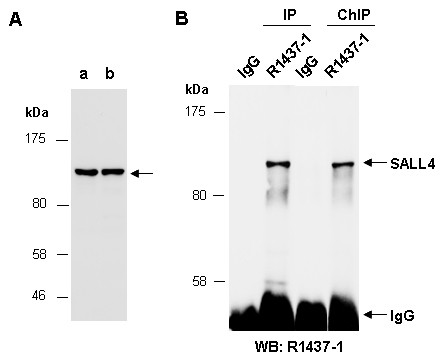 (A) Western blot of total cell extracts from a. human HeLa, b. human Jurkat, using anti-SALL4 (N) (R1437-1) at RT for 2 h. (B) Total extracts from human HeLa were immunoprecipitated (IP) with IgG or anti-SALL4 (N) (R1437-1) under the conventional IP conditions or cross-linked chromatin immunoprecipitation (ChIP) conditions; followed by WB with the same Ab at RT for 2 h.